I have been making homemade biscotti for many years: always at Christmas time, and always to give away as gifts. . . leaving me with the smaller end bits of biscotti to eat, and (I’m not ashamed to admit) the chunky crumbs from the bottom of the cookie tin. I decided this year to make some biscotti just for myself, and while I was at it, to make a entirely new flavour. All for me. Playing around with flavour combinations, I reminded myself that in biscotti, as in life, there can never been too much chocolate. So chocolate was a must. And as soon as I decided on dark chocolate, the rest of the recipe idea fell into place. 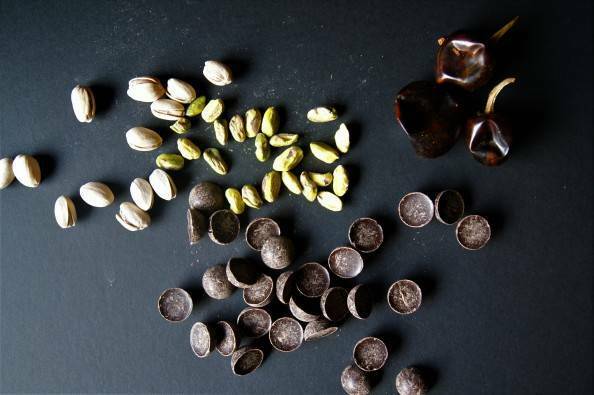 Raw pistachios and sweetly spicy red chili seemed just exactly what I was craving with some dark chocolate to dip into a cup of steaming tea or coffee. I only needed to test the recipe once. 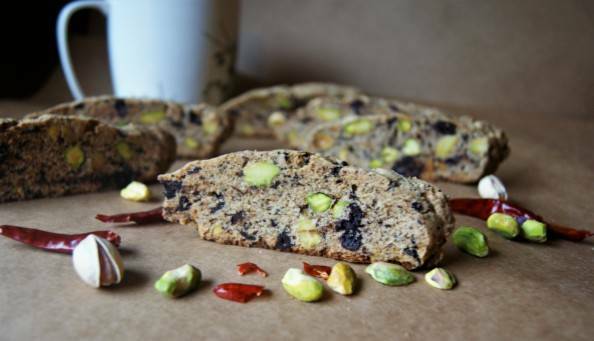 My classic biscotti formula adjusted to include pistachio, chopped bittersweet chocolate, and freshly ground red chili was bursting with flavour, heat, and complexity right from the first bite. And of course, using super fresh Rancho Vignola products (their pistachios and their dark baking chocolate domes) only made everything better. BUT it never hurts to test something a second time, right? Especially when it allowed me another three dozen delicious biscotti to eat? All for me!! Now, ON TO THE COOKING CLASS DISCOUNT GIVEAWAY! My friends, fans, and loyal blog readers, Rancho Vignola has stepped up once again to sponsor my business activities, this time by covering 50% of the cost of one of my cooking classes. What this means for you, dear readers, is that I will be selling twelve spots in my newest cooking class, Flavours of the Exotic, for half-price! That’s $50 for a full three-hour hands-on cooking class, and includes a take-home recipe booklet and full delicious meal. 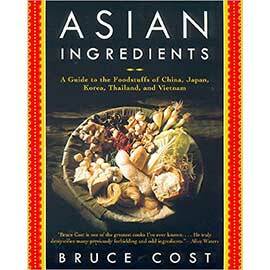 World cuisine is known for its explosions of flavour, its liberal use of fresh produce, and its cooking techniques that make even simple ingredients taste spectacular. What are the secrets? In this class, I will de-mystify the ingredients and techniques needed to create mouthwatering vegetables, grains, fruits, and legumes. Borrowing inspiration from Asia, North Africa, Central America, and beyond, we will walk away with a better understanding of how to cook well and stay healthy, with a collection of recipes that will WOW our friends and family. Vegan/vegetarian friendly, but techniques learned in class will apply to omnivore cooking as well. What is being given away here is a 50% discount. You are entering to win a Chef Heidi cooking class, normally valued at $100, for only $50. Bonus: Rancho will be providing some of their new-crop nuts and dried fruits for our class menu! 1. You are entering to win a discount on a Chef Heidi cooking class. Her classes are normally valued at $100. Draw winners will pay only $50. 2. No purchase necessary to enter the draw, but if you win the discount, you will be expected to pay the remaining 50% value of the cost of the cooking class – in this case, $50 per person. 3. Four discounted cooking class spots will be available for a draw each time I post for the next three weeks. That means there are 3 chances to win! 4. Enter the draw by commenting on the blog post or on my facebook fanpage that day. A new blog post will go up every Sunday for the next three weeks. Each draw will last for 48 hours, after which I will close comments and pick the winners by random draw. 5. This discount giveaway is open to any Canadian or U.S. resident who can make it to Victoria for the date of the class (Feb 25th, 2017). 6. This discount cannot be applied to any other cooking class. It applies only to the Rancho Vignola sponsored vegetarian cooking class offered Feb 25th, 2017. 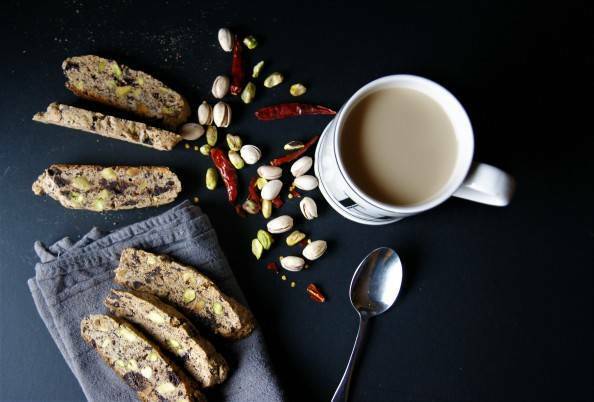 These biscotti with raw pistachio, chopped bittersweet chocolate, and freshly ground red chili are bursting with flavour, heat, and complexity right from the first bite; perfect for dipping in a steaming mug of hot cocoa, tea, or coffee. 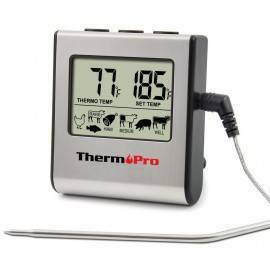 Preheat oven to 325° F. Line a large sheet pan or cookie sheet with parchment paper. In a large bowl, whisk together the flour with the baking powder, soda, salt and ground chili. In the bowl of a standing mixer fitted with the paddle attachment, beat the eggs and egg whites until foamy. Add the sugar and beat until thick and creamy. Beat in the vanilla extract, melted butter, pistachio, and dark chocolate. On low speed, stir the flour mixture into the wet ingredients, mixing well to combine. Divide the dough in two and place them about 4 inches apart on the parchment-lined baking sheet. Shape each into a smooth, flat-topped log about 1½ inches wide and about 15 inches long. Place in the preheated oven and bake for about 25 to 30 minutes, until they feel firm to the touch. Remove from the oven and let cool for 15 minutes. Turn down the oven to 275°F. 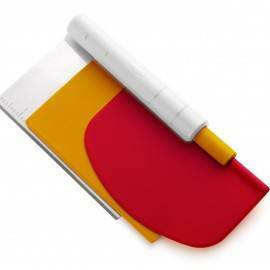 Place logs on a cutting board and slice on the diagonal into ½ inch slices. Arrange the slices upright on the baking sheets, leaving a bit of room around each for air circulation, and bake them again for 20-30 minutes. Let the biscotti cool on wire racks. Store in air tight containers. Their flavour will improve in a few days. They will last about a month if nobody eats them first! Flavours of the exotic sounds intriguing, and healthy. Your classes are always the best. Every time I make beans and greens I’m glad I took that Mediterranean class! We’re In Victoria watching the snow fall! Love the Rancho Vignola products and even brought some out here from Calgary, Airdrie is where I bought em. Flavours of the exotic does sound fascinating. You are a fabulous teacher Heidi! I am definitely going to try the biscotti too. Wow, this biscotti looks so good! I am going to make it. It’s snowy here today and I have Rancho Vignola Pumpkin Seeds in the cupboard. I’ll stay home and substitute those for the Pistachios. I’ll let you know how that turns out! Thanks as always for your inspiration. Leanne, I bet that will be a fantastic substitution. let me know how it tastes. “Flavours of the Exotic” class sounds awesome. Flavours of the Exotic sounds like a great class especially as our family includes a vegan and a vegetarian. Learning more about seasoning and spices from around the world really helps when making vegan/vegetarian meals for omnivores. I can’t wait to try the Biscotti! The Flavours of the Exotic cooking class sounds amazing! I have taken your Thai classes, as well as your Seafood, Mexican, and Pie Making and loved them all. I just made the secret pie crust with vodka the other day and it turned out perfectly as always. I’m enjoying a snow day today and the Biscotti recipe looks like a great one to try with a mug of warm hot chocolate! Flavours of the Exotic sounds wonderful! It would be great to learn more about seasoning and spices!! 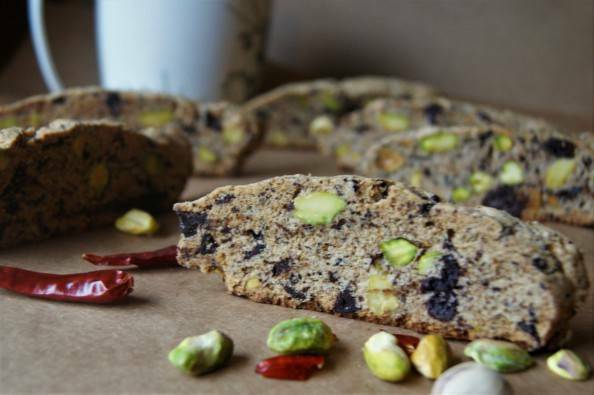 Can’t wait to try this new biscotti recipe either as I have a few of your other recipes and make them every Christmas! Sounds like a great combo of sweet/spicy/crunchy! Could I substitute a gluten-free flour (like the one from Bob’s Red Mill) and still have great results or would some tweaks need to be made? The biscotti look really delicious and so does the cooking class. I will definitely be trying This recipe. Yum! It would be great to spice it up in the kitchen! Lol! And I love rancho vignola products, nothing compares to their quality! Love your unique biscotti. Will be trying it for sure. The new class sounds exciting. Hope I’m a winner. 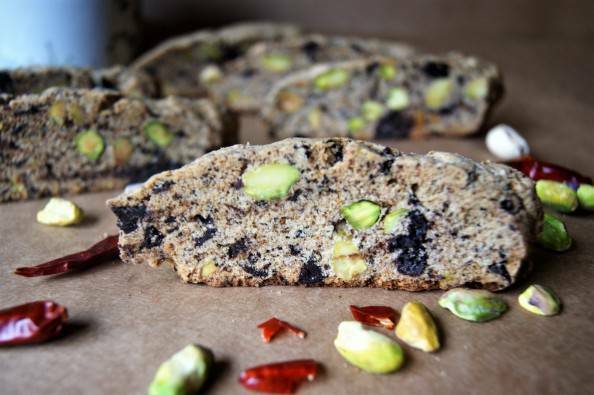 Your biscotti looks amazing; I will definitely need to try this. I would love to attend your new cooking class! I so want to learn all about flavour! Looking forward to your new class! Yum! I made Yotam Ottolenghi’s ginger and pistachio biscotti for Christmas and they were very good, but these are very festive. Mine turned out quite tender and I really love the crisp ones you need to dunk in your coffee. I wonder what these chocolate, chili ones are like! is the Flavours of the Exotic class only for prize winners? It doesn’t appear to be on your class schedule. If so, I hope you will offer it again. Sounds wonderful. this term it’s only for prize winners, but I will offer it again in the regular class rotation. Looks delicious as all your recipes. Ooh. what a great combination of flavours! I want to try these! Yum! I can’t wait to try the biscotti with a warm cup of coffee. A perfect treat in this cold weather. Thanks for sharing another fantastic recipe, Heidi! Fingers crossed I see you again at the Flavours of the Exotic class. 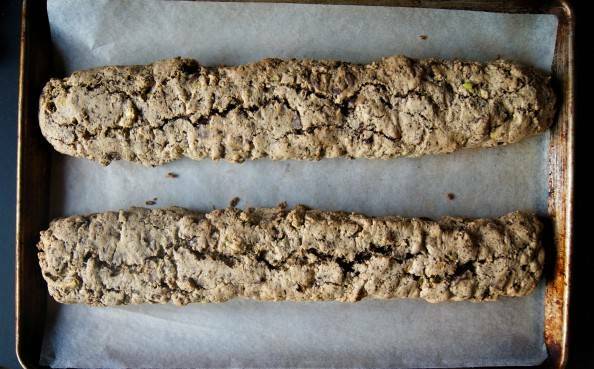 The biscotti recipe looks declicious. Can’t wait to try it. Flavours of the Exotic sounds like exactly what I have been waiting for! Looking forward to another wonderful class with Chef Heidi! The biscotti looks fabulous! Will have to alternate making them along with the pies I can now make thanks to Pie 101! Would love to take the Flavours of the Exotic class! I love biscotti. I’m definitely going to try this recipe. The biscotti looks amazing! And so does the Flavours of the Exotic class! 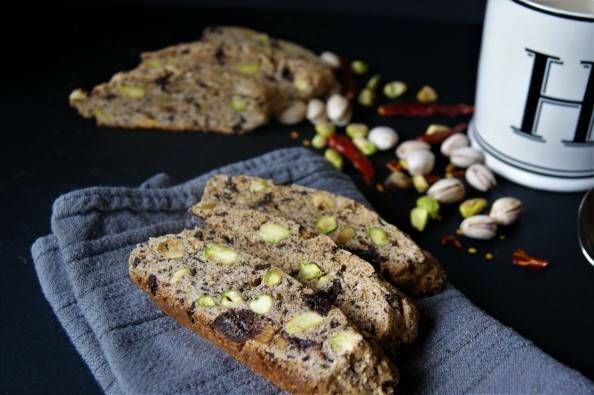 Thank you for posting such an innovative biscotti recipe! I’ve been hesitant to use different types of ground chili in my baking but I’m inspired to try now. I love your classes and most informative blog posts! Maureen – you are welcome and thank you! These look absolutely delightful. I can’t wait to try them! These look so yummy! Can I substitute the flour for a gluten free substitute? What a beautiful looking cookie! The flavor combo is really interesting too. Thanks for sharing! Biscotti are such wonderful cookies – I love them and will be sure to make your version very soon. So intrigued by the combination of flavors! Sounds so delicious!